I have a thing for pears. I didn’t always have a thing for pears. But today my thing for pears is huge. 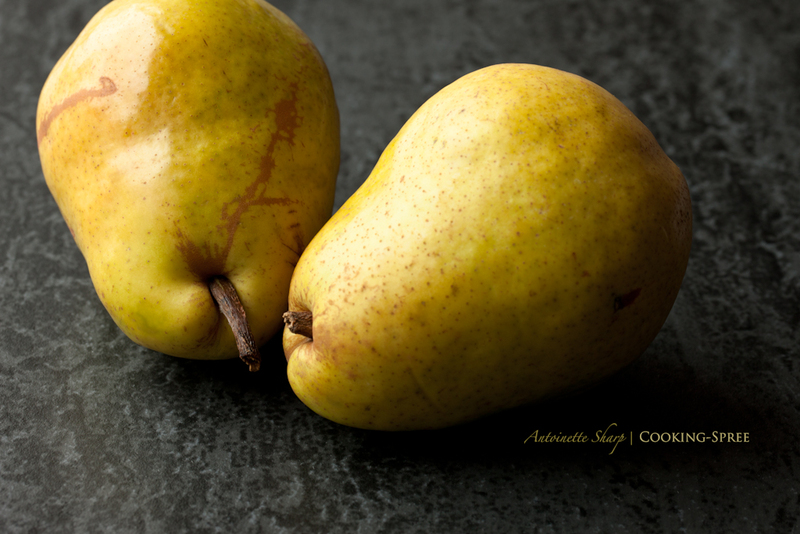 And I think perhaps you need no more of my words on pears, but only to gaze (with your own eyes) upon their shapes, their colors, their stems, their dimples and imperfections, to know why it is I have this thing called love of pears. Of course it’s not all about their looks. They’ve got that whole flavor and texture thing going on too. Here’s one delicious way to enjoy these beauties. For this recipe, I like d’Anjou or Barlett or Comice – and since you want them to stand up to the heat of caramelizing, begin with under-ripe fruit. My husband’s got a thing for blue cheese. 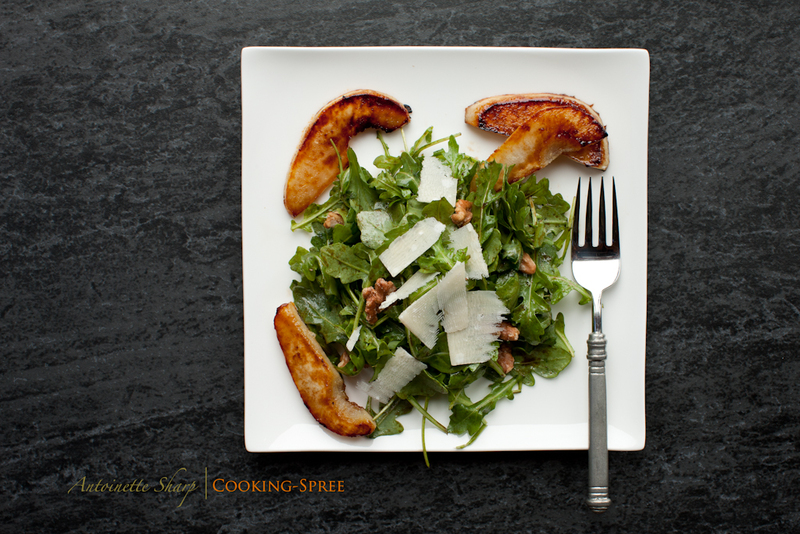 So, that’s one way you could make this salad (and I did for him) – but just as good (and far better if you don’t happen to like blue) is Parmigiano-Reggiano. Each of these cheeses pairs up beautifully with pears. I told you in an earlier post about this Olive Oil store near us. (Also on line www.oilerie.com) We were in there the other day to re-stock on our lemon-olive oil. (So good!) Do you think I could walk past the pear balsamic without tasting? Do you think I could walk out of the store without a little bottle tucked under my arm? (oh it was paid for!) The salad I made for us last night was made with pear balsamic and walnut oil – neither of these are necessary – at all! Olive oil and any good balsamic will do perfectly. But I had them, and it was good. Very good. Prepare the vinaigrette, 2 parts oil to 1 part balsamic, in a small jar. Add salt and pepper to taste. Shake well. Set aside for flavors to marry. 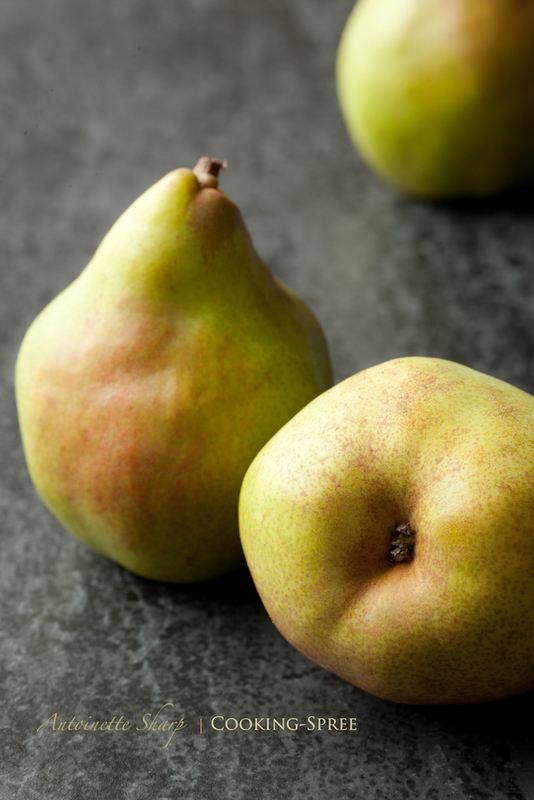 Prepare the pears – peel the pears and slice in half lengthwise. Either with a melon-baller or spoon, remove the core and seeds. Lay each pear half down flat and then cut each into about 5 or 6 lengthwise slices. Using a cast iron skillet or other heavy skillet set on medium (or slightly hotter) heat, melt 1 tablespoon butter per pear. Sprinkle 2 tablespoons of sugar (per pear) over the melted butter. Distribute the butter-sugar mixture evenly over the bottom of the pan then lay the pear slices on top. You’ll want to watch closely – adjust the heat so that the butter is brown but not burning. 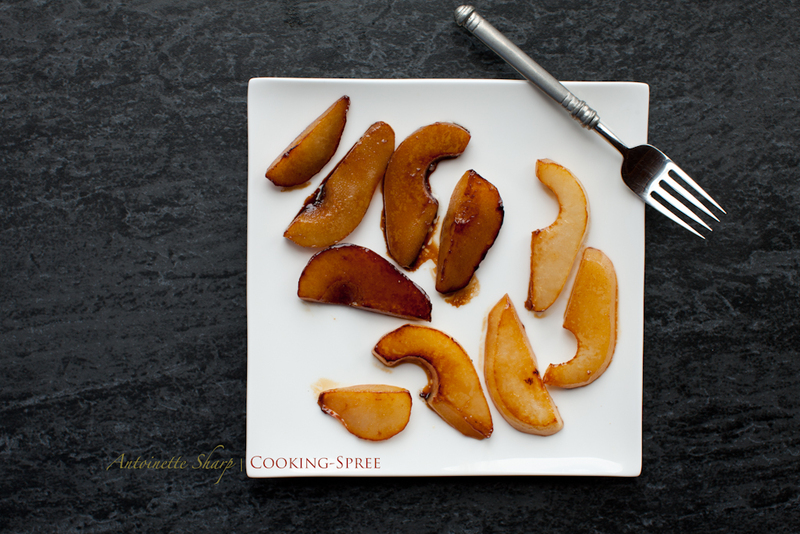 In approximately 5 minutes the pear slices will have at least begun to caramelize on the one side. Flip them over using a small spatula. Now you have another option – to splash ever-so quickly with a little extra balsamic – or not. 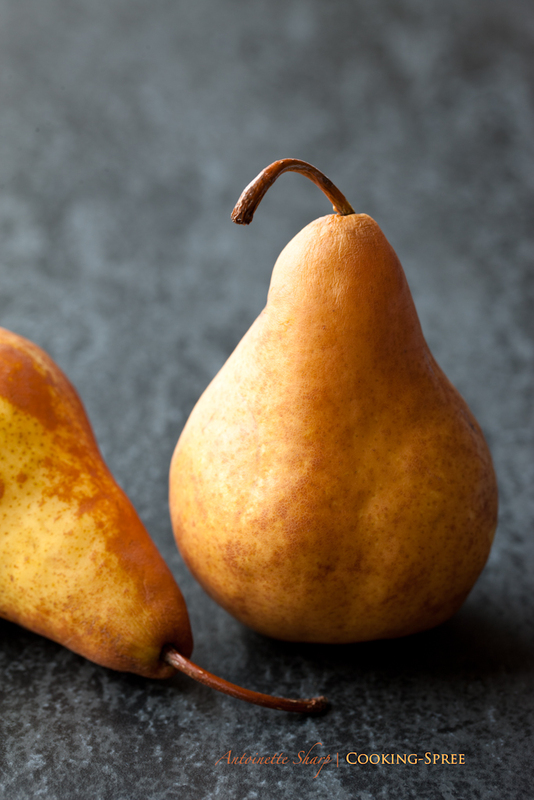 The photo below shows 2 versions of the same pear. I found I needed to act quickly with this final step, but we really liked the results. Just splash a bit of balsamic over the fully done pears, swirl quickly to coat, then remove from heat. 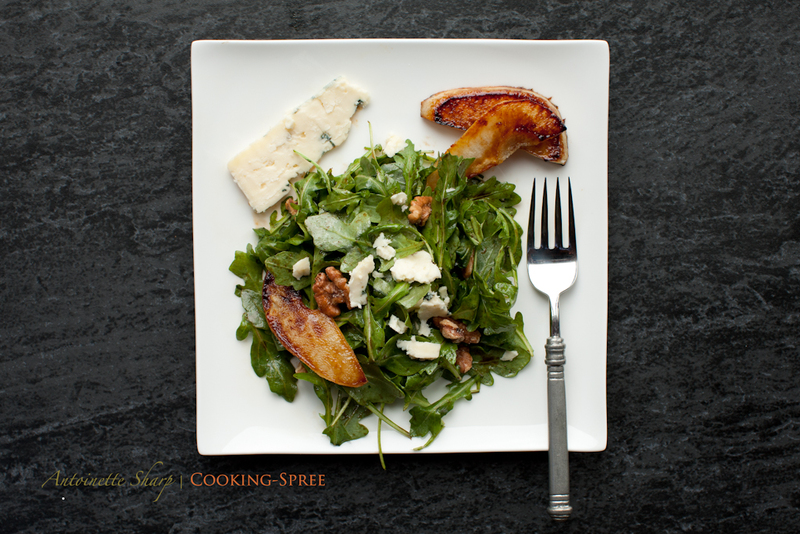 Finishing the salad – Toss the greens and walnuts with a small amount of vinaigrette. Add shavings of Parm or crumbles of blue over top. Pears can be served alongside or draped any which way you like. And the finished salads, one with Rogue River Blue and the other with Parmeggiano. 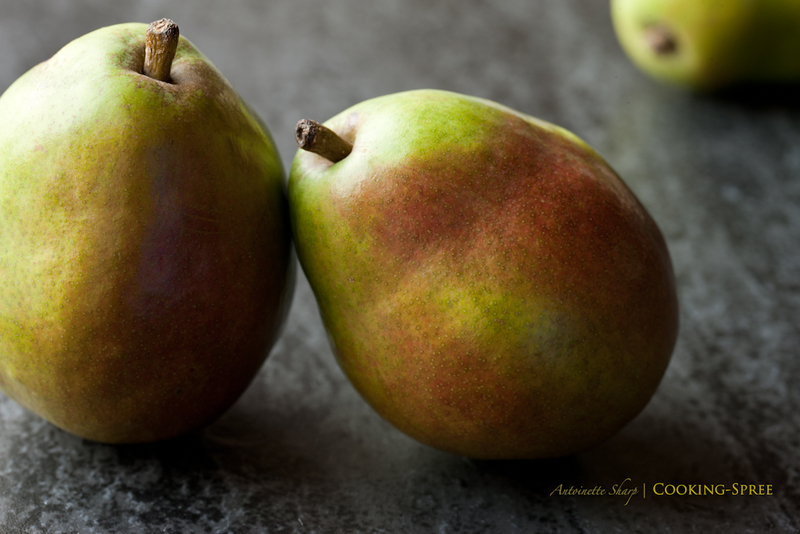 These pears are adorable and beautiful in all their flawed loveliness. These look and sound scrumptious! What a fun and different post, Mama! Oh my! My knees are weak…. I will have to get some pears and try this tonight. I can’t wait to try this!! And an excuse to get more Rogue Blue…thank you!! Gorgeous photos!! I want those for my kitchen!! Yum! This dish look soooo good! How do you take such georgous photos? (Hopefully the answer doesnt include buy an expensive camera… but I suspect it does). Just made this tonight! Those pears, oh my!! I also added chicken breast marinated in balsamic, olive oil, garlic, lemon juice and S&P for a complete meal! So good, thank you!! Thanks so much for letting me know! And the addition of chicken (balsamic-marinated) sounds wonderful!